Hello GTSD faculty and staff! I hope that you are enjoying the summer months and staying cool. As promised, here is a quick overview of the district integration of Google Apps for Education. Please read through this post, as well as the Google Apps Documentation and Support page. Experiment with the different tools. Consider how these tools will support student learning and organization. All GTSD staff currently have access to the tools and resources available through Google Apps. This includes, Docs, Calendar, Contacts, Picasa, YouTube and others. All GTSD students will have limited access to Google Apps. All students will have access to Calendar and Docs. Grades 5+ will also have access to Google Mail. 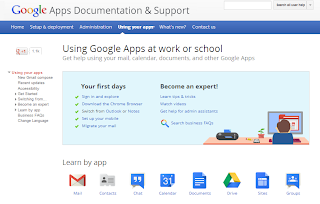 For step by step and video guidance on using Google Apps, please visit the Google Apps Documentation and Support page. The student wikis now have a link to the Google Apps login page. Once you have completed the initial setup process, access your Google Apps account from any Google page (look for the login link in the upper right hand corner). Login will be your school email address, password will be the one you selected for Google Apps. If you access Google Apps through the GTSD portal, you will only need to enter your username and password (you will see the "@gtsd.net" after the user name field). Messages are grouped in conversations to make it easier to see the conversation in its entirety. Conversations are grouped in part by the sender and the subject. When sending a message, follow good email etiquette and be sure that your subject truly reflects the message contents (ie, don't just reply to a recent message). All GTSD Staff are automatically added to the Contact Directory, no more guessing for email addresses! Student addresses will also be added the directory. Mailing lists: Please look for an email message regarding GTSD email lists. Details about subscriptions and subscribed audiences will be included. Use the default calendar as your personal calendar. Create a new calendar to share on your wiki page or with students. You can share calendars with colleagues, allowing for grade level calendars. Pay close to attention to how your calendars are shared -- you will need to make it public to post on the wiki. Look for the GTSD Professional Development calendar. This calendar includes not only the GTSD offerings, but vendor and association sponsored online and face-to-face opportunities. The Media Specialist and Reading Specialists will maintain this calendar, please contact them to add PD opportunities that you feel other staff members will find beneficial. Documents includes basic word processing (Docs), spreadsheet (Sheets), slide presentation (Slides), and Forms. Also included is my favorite tool, Forms. Forms can be used to collect survey responses, as a short assessment, or as a student response tool. To learn more about forms visit Create a Google form. You can create folders and subfolders to organize your documents. MS Office and PDF files can be uploaded and converted to Docs. Docs files can be downloaded as MS Office or PDF files. Did you you know Docs has built in Google search? Pay close attention to how documents are shared, always keep in mind colleague and student privacy. Chrome is Google's web browser. Once logged in, you have quick access to Google Apps. Your toolbar and Apps will also be accessible from any computer (when logged into Chrome). The Chrome Web Store has a special section of recommended Apps for GTSD. Google Docs: the tool for the 21st century classroom: Reducing paper in the classroom by sharing and turning in work digitally.